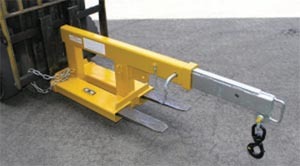 Slip-on jib, suitable for most forklifts and fitted in seconds. Two lifting points available. Supplied with a safety swivel hook. 2000kg SWL at 500mm load centre. 2000kg SWL at 1000mm load centre. A general purpose jib at an affordable price. Able to manoeuvre in a confined space, then extend to 2.0m. Overall length when closed 1.3m. Pallet hooks allow for lifting palleted goods by overhead crane. 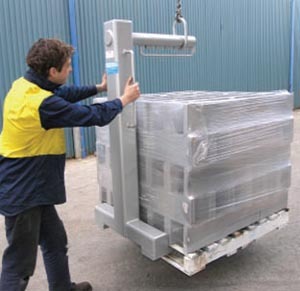 Load balancing is carried out by altering the position of the lifting ring to suit the centre of gravity of the load.